PeterB Photography: What is the best time to photograph? Most people starting out in seaside photography with any real intent favour either the pre-dawn to sunrise period or the sunset to last light period. Certainly my most dramatic shots are from those time periods. After a while, it all gets too easy and it is just photography by numbers and it is good to try a bit at those times generally deemed to be less suitable. Yesterday, with storm clouds moving overhead I grabbed my camera and strolled down to the beach. The accompanying photo was taken just before 3pm, almost 3 hours before sunset. 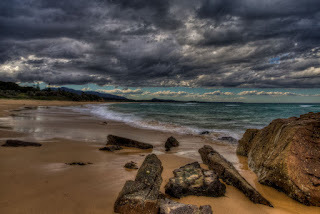 Haywards Beach, Bermagui - taken with an Olympus E-P3 with Olympus 12mm f/2 and 2-stop soft grad.